NumisMedia prices are now available to current member dealers of the Certified Coin Exchange*. Get access now, become a NumisMedia/CCE Dealer Subscriber to view NumisMedia Market, FMV and CAC prices within the CCE View Market/Quick Price system. * Current CCE Members must have CCE Quick Price access to view NumisMedia Prices on the CCE View Market/Quick Price system along with the NumisMedia/CCE Dealer Subscription. The NumisMedia/CCE subscription also includes access to ALL of our Online and Mobile Price Guides - Market, FMV, PCGS, NGC, CAC, & Plus+. The pricing information we report comes from all over the numismatic market, from reliable dealers known for their unbiased market knowledge. 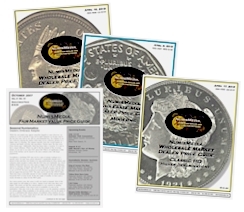 Dealer subscribers are a part of our numismatic community, responsible for assisting us in our never-ending pursuit to report real market prices. 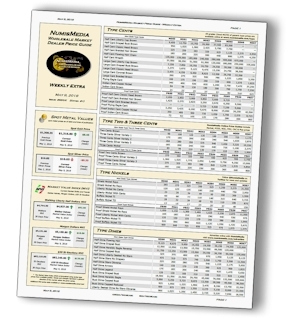 Now included for all NumisMedia Dealer Subscribers and Members, the NumisMedia Weekly Extra Wholesale Market Dealer Price Guide, in PDF. This comprehensive look into the coin market is our most complete publication yet, and it’s got everything dealers have been asking for. Dealer Subscribers and Members will receive the Weekly Extra, in PDF format, every Wednesday. These discounted rates are for NumisMedia Members only. Not a Member yet? Join NumisMedia Today! CCE Dealer Subscriber access to NumisMedia Market, FMV, and CAC prices within the CCE View Market system will be available upon receipt and approval of order (usually within one working hour). Dealer Subscribers will receive the current password and user name for full access to the Online & Mobile Dealer Price Guides via email (usually within one working hour). A new monthly password and username will be sent via E-News at the beginning of each month. Not a CCE Member Yet? What is the Certified Coin Exchange? Certified Coin Exchange is a sight-seen/unseen, rule-governed trading system for coin dealers. Since 1990, Certified Coin Exchange (CCE) has been a key intermediary in U.S. certified rare coin trading between major coin dealers. The messaging system (CCE/FACTS) is currently the largest dealer-to-dealer numismatic network on the Internet. Currently there are over 100,000 bid and ask prices on CCE, and live trading occurs daily. The trading floor features PCGS, NGC, ANACS and ICG-certified coins. A total of over 500 member and associate firms place bid and ask prices, execute trades, and conduct business using Certified Coin Exchange. Why should I be a member of CCE? What is CCE Quick Price? 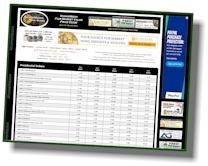 CCE Quick Price is the one stop coin pricing resource... CCE bids/asks w/dealer IDs, PCGS/NGC/CAC population, PCGS/NGC Auction Prices Realized, NumisMedia Prices (Market, FMV, and CAC values), PCGS Price Guide, and other resources - all available on one screen! A must have for quickly and efficiently pricing PCGS and NGC graded coins. To subscribe online with PayPal's secure online order form, click on a 'Special' above. You can pay instantly even without a PayPal account (a PayPal account is required for Recurring Subscription Rates). Collector subscribers will receive the current password and user name for access to the Online FMV, CAC and Plus Price Guides via email (usually within one working hour). A new monthly password and user name will be available on page 3 of the Monthly FMV Price Guide. Dealer subscribers will receive the current password and user name for full access to the Online & Mobile Dealer Price Guides via email (usually within one working hour). A new monthly password and user name will be sent via E-News at the beginning of each month and can also be found on the back page of the Weekly Dealer Price Guides. To order by phone with a credit card (current or back issues), call (951)303-1496. For credit card payments by fax or phone include card info, full name and billing address of card. Make check payments out to 'NumisMedia' and send to the address in the right column. Print issue special rates are for United States addresses only. All of our prices are available in Excel Database Format (.xls). There are monthly, weekly and one-time database licensing options.